Over the years there has been an absolute obsession with neutrals and even pale pastels and dark navy are as ubiquitous as grey and taupe these days. Bright colours make a bold statement in the world of art and design, therefore offering a much needed, optimistic wake up call from our neutral slumber. Different colour trends co-exist in current interior design. They all have their place in positive spaces that let people thrive. The pace of change in colour trends is increasing, making it hard to keep up with the times. In conclusion bright colours can easily create a feeling of playfulness. Similarly – the intensity of brights can be a turnoff for some and an absolute obsession for others – so be considered in your design. When in doubt, trust your intuition. Applying intense colour to a space can encourage movement, collaboration and activation. 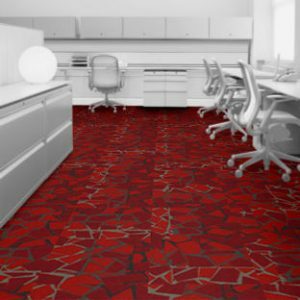 A floor design is an important element of any space. 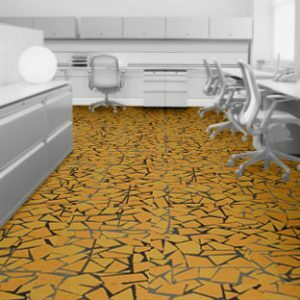 Want to create a floor with maximum impact? Use a tile with variation in colour and structure, like one of our latest additions, Multichrome. Or tone it down a little with Monochrome, which offers structure in a single colour. Combine two Composure colours with the Composure Edge transition tile, and you get a floor that offers both neutral and bright with an organic texture. The most important thing to remember with brights is balance – seek saturation when needed and create calm with muted tonal greys in sophisticated shades like concrete and cement. Colour catches the eye in an exaggerated display of saturation – therefore, give in, embrace it in moderation to create an exceptional space. Our modular system helps customers create interior spaces while positively impacting the people who use them and our planet.